The Pediatric Intensive Care Unit (PICU) is staffed 24/7 with physicians and nurses who specialize in taking care of critically ill children. A multidisciplinary team consisting of board-certified/eligible pediatric critical care physicians, subspecialists, nurses, nutritionists, pharmacists, social workers, child life therapists, and discharge planners who work together to develop a comprehensive plan of care that meets the unique needs of each child and family. The PICU provides evidence-based critical care using state-of-the-art technology, to all children from the newborn (neonatal) period up to their 22nd birthday in a family-centered care setting. Evidence-based means that our clinical decisions are based on a combination of clinical experience, patient and family preferences, and the best results (evidence) from research. The PICU is a 15-bed unit with all private rooms and can accommodate a parent at the bedside 24/7 depending on the child’s condition. Each room is equipped with a large screen TV that has entertainment features for your children as well as Internet access that enables you and your child to remain in contact with your friends and family. Bathroom and shower facilities are located conveniently just outside the PICU. Because of this, patients receive the best, most advanced care possible. We are always mindful that we are treating children and their families, and all care is geared to providing high-quality care while minimizing stress as much as possible. Each child who is admitted to the PICU is seen by a physician who has specialty training in pediatrics and who subsequently received additional subspecialty training in pediatric critical care medicine. This type of doctor is known as an intensivist. The intensivist may be the primary manager of your child’s care or may work in concert with other physician specialists, e.g. a neurosurgeon. In either case, the intensivist’s role is to coordinate the care of the many physicians and other specialists who may be involved in your child’s care. The intensivist is available in the Hackensack University Medical Center PICU 24/7. We are fortunate to have professionals from many disciplines such as respiratory therapy, child life, pharmacy, nutrition, social services and others working closely together as part of an integrated team designed to bring your child back to health as quickly as possible. In keeping with a family centered philosophy of care, the PICU has an open visiting policy for parents and guardians. All other visitors can visit from 7AM-10PM. We have the ability to accommodate one parent sleeping at the bedside depending on the child’s condition and space for a second caregiver to sleep outside the PICU. Children over the age of 12 years old may visit at any time. We ask that children with fevers or coughs or rashes not to visit so as not to potentially spread contagious diseases either to their brother or sister or to other patients in the PICU. Children under 12 may visit with permission of the Nurse Manager and Intensivist on duty. As your child’s medical condition improves and intensive care is no longer required, your child may be transferred to the general pediatric floor, oncology unit, or Epilepsy Monitoring Unit for further care by your pediatrician or subspecialist physician. This is a reflection of your child’s improved medical condition and is a positive step. Your child will be able to go to the playroom as his/her condition permits. Each room on our general floors is private and has a full bathroom where your child may shower or bathe as permitted by your physician. 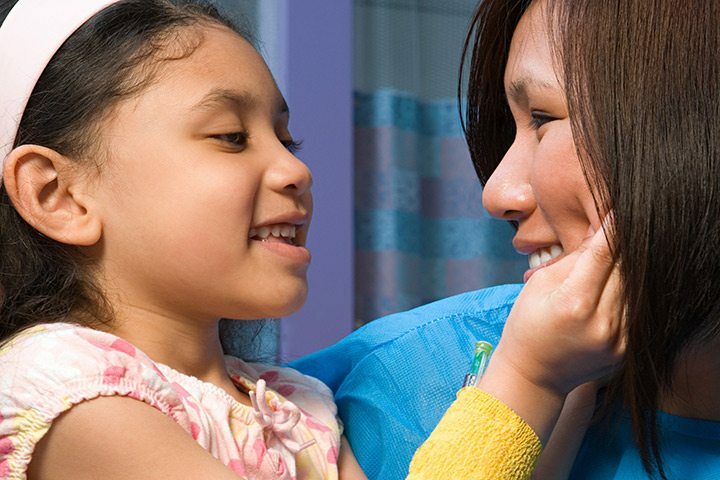 Visit our Pediatrics Social Work page for many helpful online resources that you may be interested in. Are you receiving care or visiting a loved one who is? Our Patients & Visitors sections provides our visitors with the information they need to enjoy their visit to our campus.